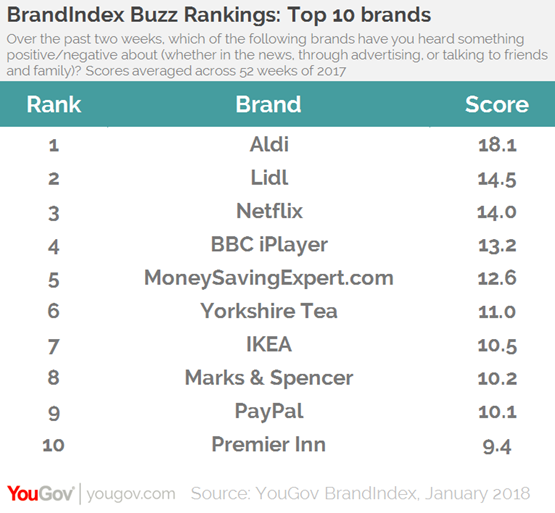 January 22, 2018, 10:12 a.m.
For the fourth year in a row Aldi and Lidl fill the top spots onYouGov BrandIndex’s list of the top 10 UK brands . After a solid year for the discount retailers and an impressive Christmas period, the German supermarkets maintain their status at the top of YouGov’s list of top 10 brands, reinforcing their move from challenger brands to established mainstream retailers. Aldi takes the top spot with an average Buzz score of +18.1 while Lidl follows on +14.5. Streaming service Netflix is in third on +14.0, rising three places from last year’s list, overtaking BBC iPlayer in the process (in fourth position on +13.2). Both Aldi and Lidl continue to adapt their offering evolving from being seen the ‘cheap’ option to projecting themselves as offering both value and, increasingly, quality. Arguably the big story of this year’s top ten is the increasing power of Netflix. 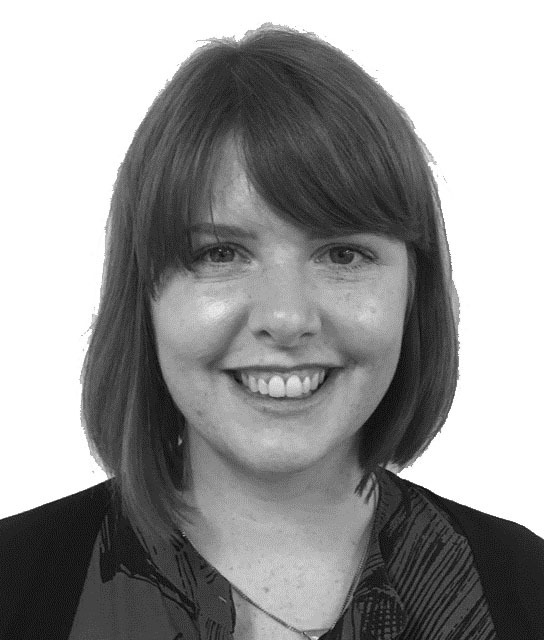 Jumping above BBC iPlayer is significant as it indicates how effective it has been in delivering its ‘quality original content’ message to both new and existing viewers. That Netflix has leapt into third place is impressive as it is the first time since 2014 that BBC iPlayer has been outside the top three. The rest of the top ten is made up of MoneySavingExpert (+12.6), Yorkshire Tea (+11.0), IKEA (+10.5), Marks & Spencer (+10.2), with PayPal (+10.1) and Premier Inn (9.4) in ninth and tenth place respectively. Premier Inn is a new entry into the top ten this year. The hotel chain has shifted away from its adverts featuring Lenny Henry and this seems to have benefitted them. In a crowded and competitive market, it has emphasised its balance between quality and value for money. 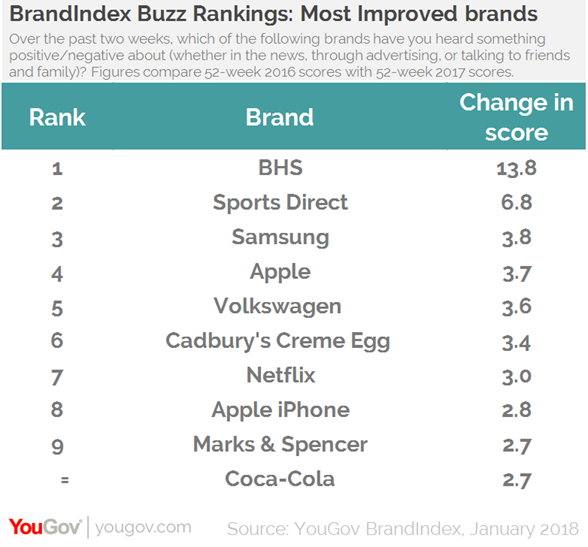 YouGov BrandIndex has also released the ten “most improved” brands of the past year, and BHS tops the list with a significant rise of +13.8 points to its Buzz score, going from -18.9 in 2016’s rankings to -5.1 in 2017’s. Though of course, it is wise to note that BHS has a significantly different offering to its previous business, both in its scale and its move from being a high street retailer to an online outfit. Sports Direct is the second most improved brand with a +6.8 rise, going from -16.9 to -10.0. Though its score is still negative, the retailer has tried to move on from the damaging headlines which impacted on its consumer perception. Samsung (+3.8), Apple (+3.7), and Volkswagen (+3.6) make up the rest of the top five as they continue to recover the ground they lost after some negative press over the past couple of years and, and in the case of Samsung and Apple, new product launches. The rest of the top 10 improvers list is made up of Cadbury’s Crème Egg (+3.4), Netflix (+3.0), Apple iPhone (+2.8), Marks & Spencer (+2.7) and Coca Cola (+2.7). BHS has been able to adopt a new, scaled down business while Sports Direct has managed withstood a wave of negative headlines. While neither has yet achieved an overall positive score, their public perception is improving. Elsewhere, while Apple has faced criticism over battery life and price of its products, the launch of a new phone model generated excitement.